In last week's review, I talked about a small concern I had with regards to Broadchurch's new path for its final series. 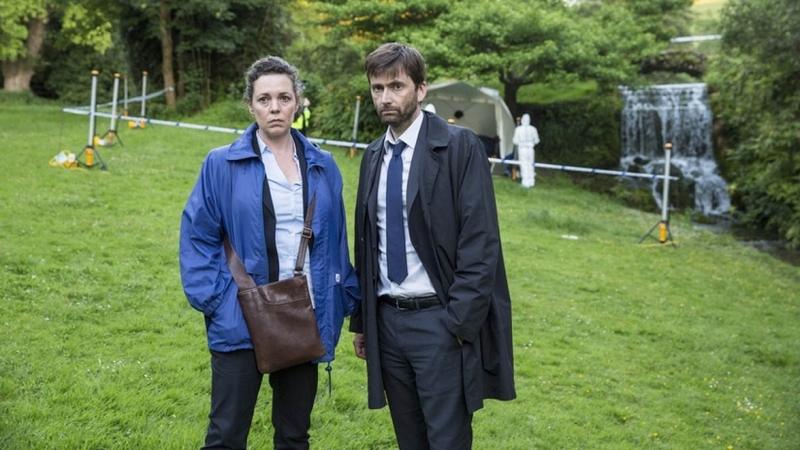 If last week's premiere raised a worry that this new kind of case would push a once great show away from its comfort zone, this second episode proved that Broadchurch is still Broadchurch - which, unfortunately, raises a whole new armoury of issues. After being introduced to Trish and reunified with everyone else last week, episode two is now able to push the story forward and begin the investigation. To the episode's credit, a lot of ground is covered here. Plenty of new faces are brought in, scepticism flies all over the place for the full hour, and we start to learn some new information from Trish herself - most notably that she slept with someone on the morning before her assault and refuses to divulge that person's identity. So on paper, it all sounds like another strong episode for Broadchurch. However, this is where things get complicated. By falling back on the typical "everyone is a suspect" approach from series one Broadchurch is essentially inviting comparisons, and series three isn't holding up to what we've seen before. There's no sense of a shattered community this time, the waves haven't rippled through the town. This could very well come later - Trish's assault isn't revealed to the public until the end of this episode - but Broadchurch's appeal is the community approach. It's what made series one so powerful, and what kept series two interesting even in its most implausible moments. Pushing that aside for the first quarter of the final series is a risky move, and one I'm not sure will pay off. There's also the case of Broadchurch struggling to balance its past and its present. While Hardy and Miller (as funny and engaging as always) are focusing on the case, episode two repeatedly drifts focus to catch up with Beth and Mark, or to check in on Maggie's failing newspaper and Paul's self doubts. The show's willingness to cut a large chunk of its previous core cast to make room for a host of new faces is appreciated, but it's tough to find room for sympathy with Maggie or Paul when something much heavier and more traumatic is given screen time on either side of their scene together. Their moments amount to little more than wasted time with no visible direction. There are a couple of other small issues running through the series thus far too. Katie Harford (Georgina Campbell) as a character isn't working. Despite Campbell's best efforts, the dialogue between Harford and Miller is awkward and forced - Harford seems to exist purely for social commentary, as she drops questions about what Trish wore the night of her assault it's tough to take the show seriously. Social commentary needs to be embedded into a show, or at least a character. When it just sits on the surface it feels unnatural. I'm also not sure it's a good approach to have everyone asked for evidence immediately refuse it, it feels like a cheap way to keep suspects at large. A new tactic will be needed by next week or the show will slip back into implausibility once more. This wasn't Broadchurch's most accomplished hour for sure, but there are sprinklings of something stronger throughout the episode. To the credit of both the script and the actors, Beth and Ellie talking about awkward childhood memories felt endearing and progressive for their characters. Trish's interview at the episode's close was compelling without sacrificing delicacy and respect, her first meeting with Beth garners the same praise. There's enough solid work here to keep the show interesting, but the foundations for series three to now spring into its full story feel unstable. By the time the episode reaches its inevitable montage of every possible suspect thus far it's easy to get a sense of the work being put in, but tough to really feel engaged by it all. Harford could well merge with the central plot. The reveal of her father being a suspect (and someone we already knew!) was unexpected, hopefully the social commentary is worked in more efficiently and she can exist as a character rather than a forced voice. I could be wrong, but was the cafe where Beth and Trish met the same cafe as where Beth first met Cate from the Sandbrook case back in series one? If so, well done show. Also on Beth, her connection with the story felt much more natural this week. Was it me, or was this the most visually bland episode of Broadchurch to date? It all felt very conventional, very tidy. I miss the wide sweeping shots already. Please bring them back next week.